Mykonos Blu Grecotel Resort features an enviable location on beautiful Psarau beach, along the dazzling waters of the Aegean Sea. Experience the ultimate in luxury, with exclusive accommodations ranging from suites with waterfront verandas and plunge pools to island bungalows and private villas featuring dramatic Cycladic décor and sweeping views. Refined and considerate service mirrors the resort’s meticulousness and utmost respect for your privacy and comfort. 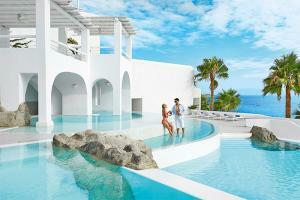 Located on Psarou Beach, approximately two miles from Mykonos Airport. Aegean Poets - Mediterranean cuisine, L'Archipel - contemporary cuisine, Delos Lounges - rooftop bar, Hello Beach - refreshing drinks and light snacks. Agios Sostis Beach, Archaeolgical site of Delos, Mykonos SeaBus, Little Venice, Psarou Beach.